or send a message to riffraff at the AtariAge forums. The first Bally Astrocade homebrew in over 20 years! War, a fast-paced arcade type game for 1-4 players, was released in late 2010. The second homebrew game developed by Riff Raff Games in recent years. 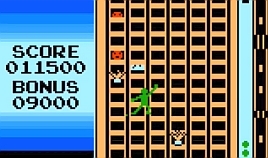 Climb to the top of tall building avoiding obstacles. This is a collection of mint boxes for the atari 2600 that have never been assembled. They were aquired in the 90's from Best Electronics when they were selling off the last of the items from Atari's warehouse. Donald Duck's Speedboat, Dumbo's Flying Circus, Realsports Basketball Promo, Swordquest Waterworld Promo and lots more. These boxes have all been sold but the images remain. My Activision patches have made their way to new homes but you can see the ones I had up close. 36 different patches, all hand-picked from a box at Activision, including the rare beamriders.